History is full of explorers and if we think about these noble pioneers, our minds are filled with fantastical images: massive Spanish galleons boldly cutting through the waves of the Atlantic, majestic explorers cresting a mountain top to look upon a fruitful and fertile land below them. We, as humans, revere those who went before us, those brave men and women who looked to the distance and left the comfort of their homes for the wild unknown. The truth is, behind this near-mythical depiction, many of our ancestral explorers were simply people looking for a home; somewhere to plant their feet where food and resources were slightly more plentiful than where they came from. Sometimes explorers and settlers have been profit driven; the great colonization of the Americas was pushed by a great many things: gold, whaling, spices. Orbital colonization is the next step in humanity’s growing need to expand beyond what we call home and seek out greener pastures. The Living in Space series seeks to show the benefits, dangers, safety aspects and concerns of orbital colonization. This week begins with an introduction to space settlements, and poses the question: what stands between us and a home in the stars? 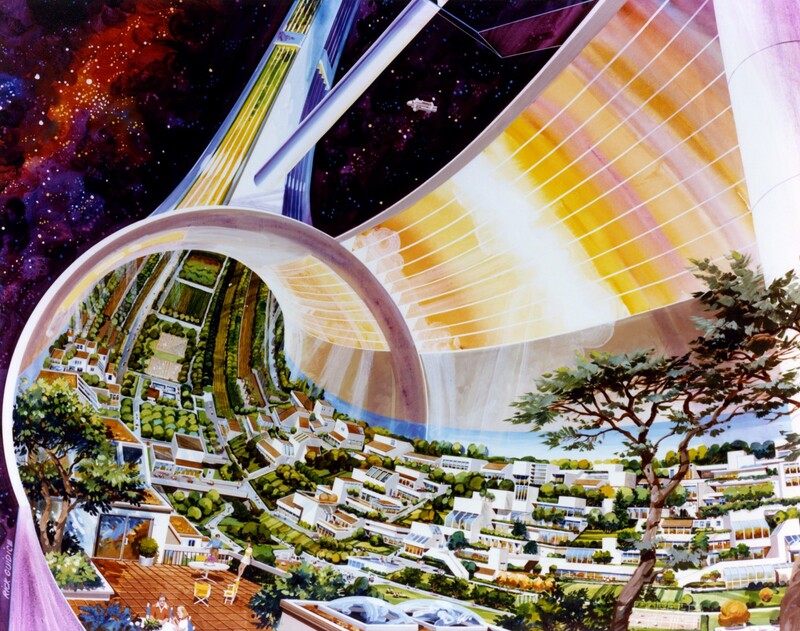 The Stanford Torus, one of several designs proposed by O’Neill, would house around 10,000 people in its central ring (Credits: Rick Guidice/NASA Ames Research Center). Mankind has dreamed of living amongst the stars since we first looked up to them, but the concept was first discussed seriously in the 1970s with the formation of the Space Studies Institute (SSI) and Professor Gerard K O’Neill’s book, The High Frontier. In the book, O’Neill outlined a roadmap for the future of the US Space program, following the Apollo missions. Beginning with the use of small habitats constructed from space debris, O’Neill’s plan called for a slowly expanding permanent human presence in orbit: developing satellites, refining ores mined from near Earth asteroids and preforming a variety of scientific endeavors. These small communities would eventually expand into larger, more stable habitats. Several of these designs were proposed, but all are vastly different from the space stations we build now. These designs called for construction on a massive scale, with some stations requiring upwards of 10 million tons of material. Space construction on such a scale is impossible using current methods since many of the designs relied on a large scale mining operation to construct them in-situ. O’Neill’s stations would be used for a variety of purposes, mostly aimed at facilitating the industrialization of space, particularly near-Earth orbits. The cost to build and launch a satellite from an orbital colony would be minuscule in comparison to current prices for Earth-based launches, and would allow the development of large-scale projects, such as massive solar collectors, planetary defenses, and space sunshades. Orbital colonies would also rapidly increase humanity’s abilities to expand further into our solar system, by providing a base from which missions could supply themselves: the need to launch with months of heavy fuel, food, water, air and vital equipment would be rendered void. An orbital colony would also provide easy access to the near Earth objects (NEOs) that surround the Earth. These asteroids contain near limitless minerals useful for almost any purpose imaginable. With the ability to cheaply mine these asteroids, the scarcity of such resources on Earth would be abated. The benefits are not all financial or technological – many saw these habitats as a potential mechanism for enabling humanity’s immortality. With a self-sustained orbital colony able to produce its own food, water, and oxygen, a calamity that could initially wipe out the Earth won’t destroy all of humanity. The excitement behind these stations eventually subsided along with the US’s interest in orbital expansion. Without a major nation or private interest in space colonization, public interest dwindled. Efforts by a variety of groups such as the L5 Society and the National Space Institute maintained the concept as a viable path of space development and campaigned for the abolishment of the Moon Treaty, amongst other projects seeking to maintain the viability of space colonization. Eventually, several of O’Neill’s ideas were shown to be far too expensive to be feasible for our means and the dream of orbital colonization settled for a time. Now, private companies and nations are taking another look at orbital colonies. Companies such as SpaceX are producing rockets with a lower launch cost than ever before. Engineering and biological advances and understanding have made habitats more viable than ever and more nations have spaceflight capability than ever before. The time would seem ripe to revisit the viability of orbital colonies, and many are. 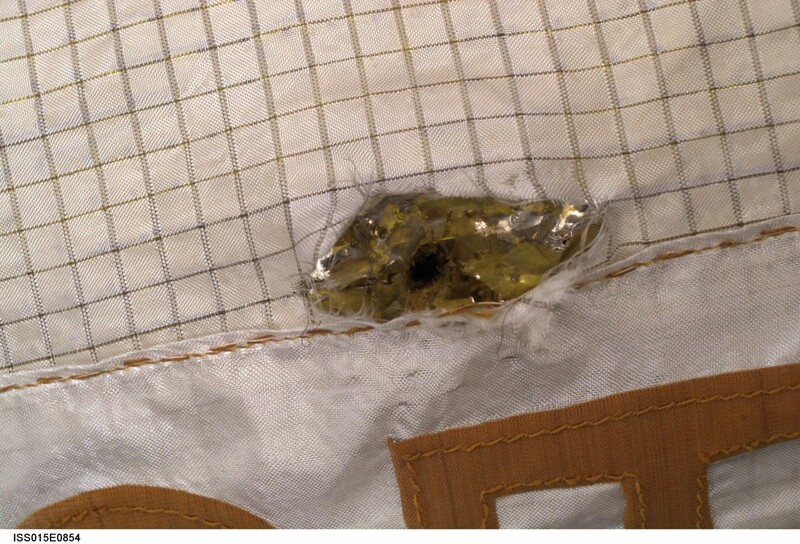 Damage to the Zarya module aboard the ISS thought to be caused by a micrometeoroid weighing less than a gram (Credits: NASA). However, despite the renewed interest, there are still many dangers to orbital colonization. Without the powerful defenses of the Earth’s magnetic field and atmosphere, colonies are exposed to upwards of 100 times the amount of radiation as we are exposed to on Earth. Therefore, colonies would have to be designed with large-scale anti-radiation solutions, and biological methods of radiation protection may be necessary. Another long term issue is the matter of asteroids and micrometeoroid impacts. While the image of an immense asteroid smashing a station apart is an astronomically unlikely event, thousands of smaller impacts will constantly erode the outer surface of any space station. Current space stations and launch craft use a variety of methods to defend themselves from the constant sandblasting of outer space, but a permanent colony would require a much more robust solution to the problem. 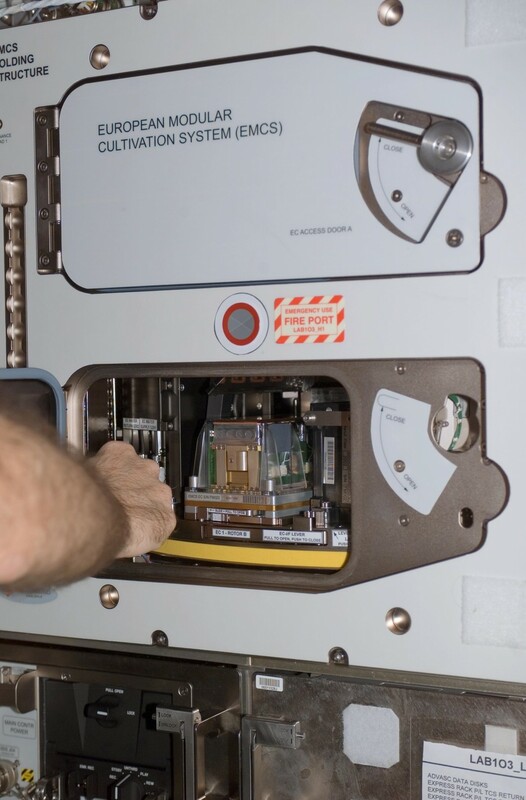 Already, astronauts aboard the ISS are experimenting with growing plants and food in space. The LADA experiment has produced small amounts of fresh food in zero-gravity. Pictured here, the European Modular Cultivation System (Credits: NASA). Finally, there is the issue of basic human needs. A colony as envisioned by O’Neill and other scientists would need to be capable of sustaining thousands of lives, providing food, water, and oxygen for everyone onboard, as well as power, entertainment, and other requirements of modern life. All of this would require farms, power generators, and the means of refining raw asteroid or lunar materials into water, oxygen, fertilizer and building materials. In addition, there are other safety concerns: microgravity, space sickness, and any number of unforeseen biological issues. The mechanical aspects also have problems: heat management and manufacturing, as well as the immediate problems of launch costs. Orbital Colonies: Is There a Future? Naturally, the greatest roadblock to realization of space settlements of the O’Neill type is the money required to execute the vision. Tritely, ‘…no bucks, no Buck Rogers.’ There are technological challenges to be sure, yet they would be overcome with sufficient financial resources. In this series, we will examine the problems and safety concerns of space colonization and their solutions. We will look at the trials, the challenges, and the rewards of human expansion into space and discuss how humanity might live in the high frontier. O’Neill was not the first to envision mankind’s expansion into space; Dandridge M. Cole and T.A. Heppenheimer both published works on the concept. Some of the larger habitats, such as Island Three, would require several more magnitudes of material. 3554 Amun, a small M-Class asteroid contains more gold than has ever been mined on Earth, and its raw metals are valued at around $20 trillion dollars. While there had been a small amount of interest from soviet scientists, the push for space settlement was primarily a US based one, albeit with many of the various advocacy groups being made up of a multinational membership. Freeman Dyson, O’Neill’s successor in the SSI, spoke about how the proposed road maps were almost 300 times more expensive than originally thought. Liam Ginty is a space advocate with a passion for systems, space settlement and public outreach. He spends his time spreading the word on orbital colonies and space industrialization amongst the general public, and aims to shift the public stance on the subject from 'Pie In the sky' to a realistic, solid goal for humanity. When not campaigning for Space, he fences, picks locks, urbexs, designs board games (www.sandypuggames.com) and travels.